The program schedule was redesigned so that courses can be accessible to more students. While the richness and intense learning of the core group cohort will remain, students who cannot attend full time can still complete regularly scheduled classes at their own pace. Content, theory and credits better match the transfer requirements of colleges such as Prescott College in Arizona, Westfield State University and University of New Hampshire. Fees have been apportioned by individual classes. And while core classes and competencies remain, such as the Wilderness First Responder certification, new skills like satellite phone protocols are being introduced. Says Teresa Jones, Chair of the Science Department, “We are excited to have OLP students taking natural history with GCC science students and have even scheduled our classes around the OLP trip schedule. 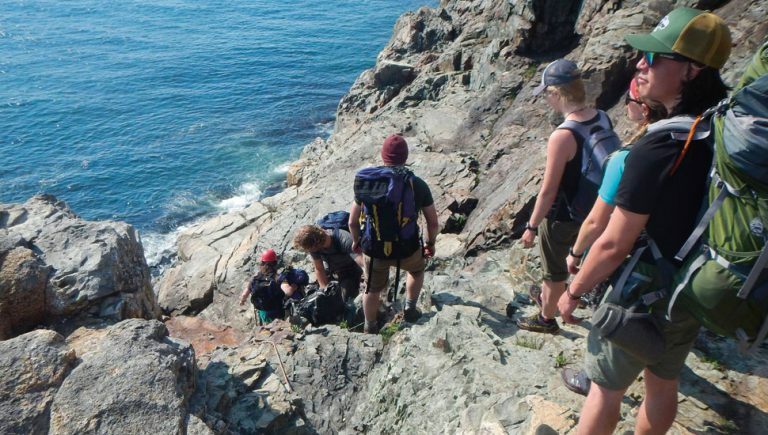 Understanding natural history can be a great asset for a trip leader who can point out native species or explain geologic features to a group.” The program is now more flexible while maintaining its high standards of excellence. Tremblay is also expanding the program with a proposal for an Associates Degree. Certain courses can now be taken as non-credit through GCC’s Community Ed. And the program will still offer additional certifications such as PCIA Rock Climbing Instructor certification, ACA River Canoe Instructor certification, ACA Coastal Kayak Instructor certification, and ACCT Challenge Course Practitioner.